In stock -This product will ship today if ordered within the next 3 hours and 13 minutes. Smell fabulous all day long without harsh chemicals. Pacifica innovative formula utilises odour neutralising ingredients for effective odour control & protection that can last for hours. With coconut milk and sugared flowers. Use as a deodorant under your arms in the morning. Take with you for reapplication as needed. Great for times when showering is not an option, after yoga, camping trips, and times of high stress. This is an everyday solution to deodorising while leaving a subtle scent that blends with everything else you layer on. A distinctive blend of sugared flowers and coconut milk, these odour-neutralising, aluminum-free wipes keep you feeling fresh and fabulous all day long. The wipes are made from natural viscose which is derived from pulp and are biodegradable. Apply under arms for odour protection. Reapply as needed. 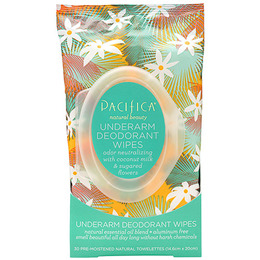 Below are reviews of Pacifica Deodorant Wipes Coconut and Sugared Flowers by bodykind customers. If you have tried this product we'd love to hear what you think so please leave a review. This is the second pack of these wipes I have purchased, although the last ones were a different 'fragrance' which I didn't particularly like. These I really like, it's a nice subtle fragrance that doesn't linger for long at all which is good to avoid mixing with favourite perfume's. Definitely freshened up and greatly reduced underarm odour to the point of it not transferring to clothes or being noticed by other people. ie not smelling of BO! You need at least one wipe per underarm and I wipe a few times folding wipe over. Doesn't sting or dry out skin and feels smooth. Would highly recommend this product, works for me.